Following the blog’s publication, a lively discussion ensued on Twitter over how much credit a president deserves for the fiscal situation on their watch. Marc Goldwein of the Committee for a Responsible Federal Budget and Brian Riedl of the Manhattan Institute rightly pointed out that Congress plays a major role in crafting federal fiscal policy and should be taken into consideration when adjudicating fiscal records by party. 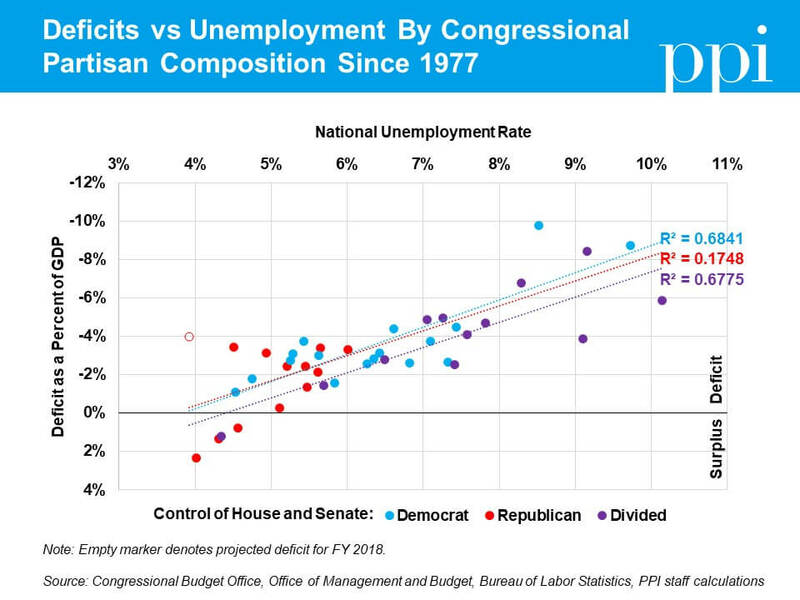 The chart above shows that, under comparable economic circumstances, deficits under divided Congresses have generally been slightly lower than deficits under unified Congresses. The chart also shows that deficits under unified Congresses have been roughly identical in level regardless of which party is in control. But there is one key way in which the partisan control of a unified Congress matters: when at least one chamber of Congress was controlled by Democrats, budget deficits have historically had a modest correlation with unemployment. 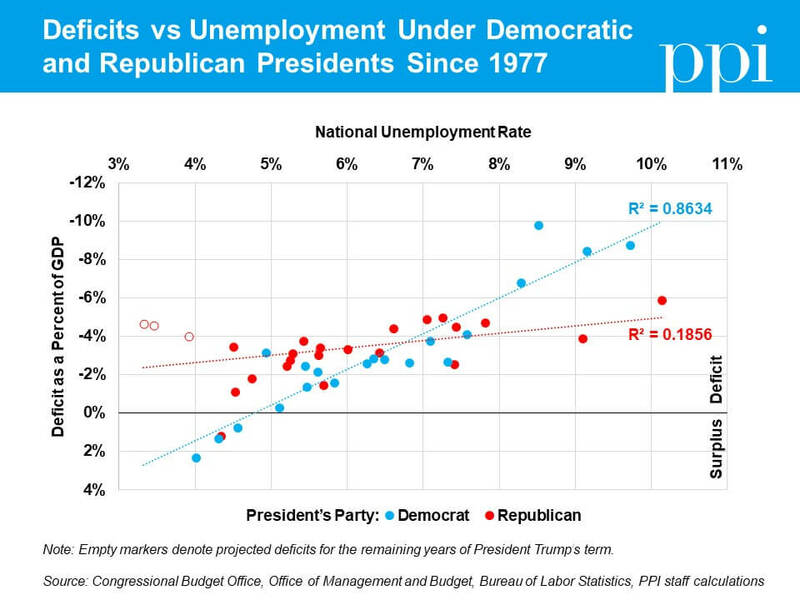 When Republicans were in full control of Congress, however, deficits have had little to no relationship with the unemployment rate. This finding appears to reinforce our conclusion from the previous blog: under Democratic governance, budget deficits have been consistent with responsible counter-cyclical fiscal policy. Under Republican governance, they have not. There are many possible rationales for why Democrats appear to have a better budgetary track record than Republicans. Goldwein hypothesized that “Republican Congresses make Democratic presidents their best (fiscal selves) while they enable Republican presidents to be their worst fiscal selves.” David Leonhardt of the New York Times, whose column last the weekend inspired PPI’s first analysis, suggested that although this phenomenon may have some effect, there have also been instances (specifically in the early years of the Clinton administration) in which Democrats pursued responsible fiscal policy of their own volition that cannot be explained by this “external pressure” theory. Regardless of the reason, there is relatively strong evidence that the federal budget over the past 40 years has been more responsibly managed under Democrats than Republicans – at least in the short term. Riedl noted that our analysis ignores the impact of policy changes implemented under a president (or Congress) that are inexpensive in the short term while costing more in later years. A cursory review of the record suggests to us that Democrats would likely still come out ahead under this metric over the past 40 years, but for now it remains a very real blind spot we hope to address at some point in the future when we have more time to compile and analyze the data. Another good point Riedl made is that the biggest contributor to long-term budget deficits is the rising cost of social insurance programs that were created by Democratic administrations more than 40 years ago. These programs, the largest of which are Social Security and Medicare, are growing roughly twice as fast as the economy as more and more baby boomers move into retirement and begin collecting benefits. Other categories of federal spending, meanwhile, are projected to shrink relative to the size of the economy. Although Democrats have generally been the more fiscally responsible party since the Carter administration, they still need to present voters with a credible plan for making their social insurance legacy from earlier years more fiscally sustainable. Doing so would cement their recent superiority on the issue of responsible fiscal stewardship and save young voters – a key component of the Democratic Party’s base – from being buried under a mountain of debt.